A basic Window program for viewing and processing Digital Elevation Models. Press Here for an screen capture of the program that will help you understand its operation. BasicDEM can be downloaded for evaluation. User may use the software as "freeware" for their own personal use and distribute as a stand alone application only. The USGS had moved all of its digital data to the Spatial Data Transfer Standard (SDTS), including elevation and line (roads, rivers, etc) data. The data is currently supplied by the USGS free of charge for the entire United States. BasicDEM's help file contains detailed instructions on how to download and unpack the data. For more details visit the SDTS www site and their download data site. The USGS has moved the SDTS files to www.gisdatadepot.com and 7.5 minute files are on a slow free or for fee fast server, sorted by state counties. Use version 2.2 of BasicDEM to read SDTS files created after January 2001. Users can read the older style DEM format with BasicDEM, including files converted from SDTS to DEM by third party software (why would you do this?). BasicDEM can also convert SDTS files to the older DEM format. 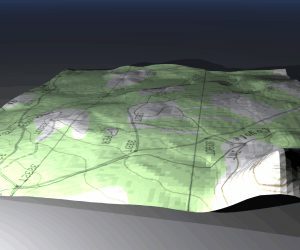 DEM files that are adjacent are merged into larger model. This is only practical for 7.5-minute DEM files. When a DEM file is read that does not touch the existing model, the old model is discarded in favor of the newly read data. BasicDEM uses two windows, coordinate window and map window. In the coordinate window, various data fields report the lat/lon, UTM coordinates, elevation and magnetic declination as the mouse is moved around the DEM map window. Exact coordinate information can be typed into either the lat/lon or UTM fields to query the DEM map for elevation at that location. The view in the DEM window can be exported as a BMP or DXF file. The DEM map has several display options, rainbow or earth tone coloring by elevation or gray scale, 1:1 or 1:2 or 1:4 size reductions and elevation contours. The contours can be displayed as either 100 meter or 200 foot intervals. The DEM in the window can be shaded for relief or directional lighting from the west. BasicDEM can generate an accurate three dimensional model from the DEM in a exported DXF file. The planar dimensions are based on UTM coordinates, but they can be relatively offset and scaled to feet. The surface of the model is described in 3DFaces, two triangles for each square in the grid. Due to the large size of a DEM file, exporting the either file as DXF would generate an unusable file over 50Mb in size. To reduce the extent of the export, a selection box can be drawn in the map view. A relative origin can be specified with the selection box. The image to the left was created by specifically selecting a region exactly 3km by 3km and importing the DXF output into Bryce 2. The corresponding region on the USGS topographical map was scanned and trimmed to match the exact area. In Bryce, the scanned bitmap was then stretch over the three dimensional model of the terrain. Within Bryce, the lighting and viewing angle were manipulated to produce the final view. Click on the image to view the high resolution version. The BMP export is simply the map view converted to a bitmap file, including contours and tracks if present. 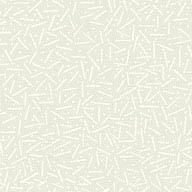 Of special interest is the gray scale bitmap export, which uses 256 shades of gray to represent the terrain. With the gray scale, the elevation is proportional to the brightness of the individual pixels. It should be noted that a single pixel is drawn for each elevation point in the DEM. This means the bitmap is not an accurate geographic projection of the region the DEM covers. The advantage of the bitmap representation is it reduced the amount of data to a more manageable size. The image to the left was created by exporting a gray scale bitmap of the 1-degree DEM which contains the Grand Canyon. The bitmap was then import into Bryce 2's terrain editor. 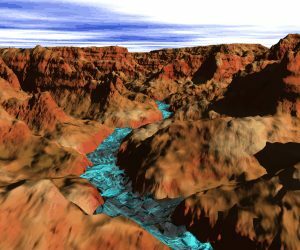 Through the terrain editor, the Colorado river was created on top of the underlying elevation model. Within Bryce the view was set just above the river, looking up stream. Click on the image to view the high resolution version.